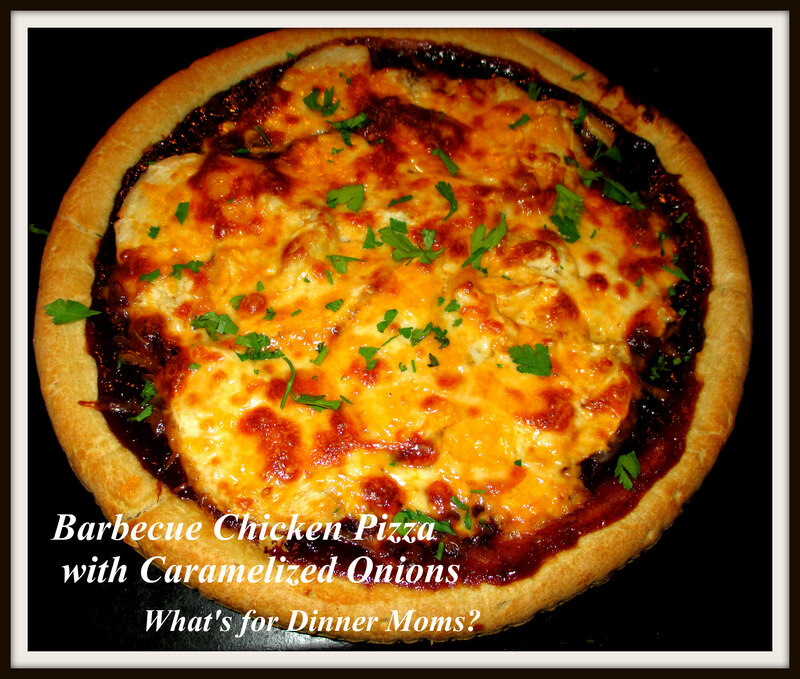 Barbecue Chicken Pizza with Caramelized Onions – What's for Dinner Moms? We are all about the easy around our house. I knew there were going to be a few nights of quick meals so I bought several pizza crusts to have on hand. I can make pizza crusts but they never seem to turn out like the pizzeria type that I want. I have tried everything from corn meal on the bottom to adding various spices. I don’t particularly care for the pre-made grocery store crusts as they tend to be a bit cardboard like but I thought I could make it better by adding lots of our favorite toppings. Caramelized onions take time to cook. You can cook them quicker but they are not as good. You need at least 20-40 minutes cooking them slowly. They get sweeter and better tasting the longer you can let them sit. So if you have the time, take your time. This was delicious! We love pizza and barbecue so putting them together is just perfect for us. I used Sweet Baby Ray’s Honey Barbecue Sauce for a bit of sweetness. Use your favorite sauce. I made two pizzas and we had enough for 2 lunch servings the next day. I served this with a green side salad. In a large skillet melt butter over medium-low heat. Once butter is melted add onions and stir until all onions are coated. Lower heat to medium-low and allow onions to cook for 30-40 minutes over low heat. Onions should wilt and become slightly browned on the edges. Stir several times during cooking so that onions do not stick to pan. While onions are cooking in a large saucepan add the garlic powder to half a pan of water. Add the chicken breasts and bring to a slow simmer. Simmer for 10-15 minutes until breasts are cooked through. Remove breasts from pan and allow to cool. Preheat oven to 350 degrees and move racks to the center of the oven. Once chicken has cooled and onions are cooked cut chicken into small cubes. Spread barbecue sauce over the center of both pizza crusts, leaving a 1/4″ of crust showing around the edges. You can make the pizza as “saucy” as you like. Divide the chicken and onions in half and sprinkle one-half of each over the barbecue sauce. Divide the cheese in half and sprinkle one-half of the cheese over each pizza. Bake for 10-12 minutes until the bottom of the pizza is golden brown and top is bubbly and turning brown. If you are using a pizza stone it may take longer to cook. Remove pizza from oven and garnish with fresh parsley if desired. Allow pizza to cool for 5 minutes before cutting.